In this article, A Shade Above – with locations in Charlotte and Cornelius, North Carolina (NC) and North Myrtle Beach, South Carolina (SC) – is here to help you find energy-efficient shades that can save you money on your energy bills. We proudly carry an excellent selection of cellular shades from Hunter Douglas. For most homeowners, energy-efficiency is a big deal. Not only is it important to keep your home feeling comfortable, but saving money is essential to most household budgets. Especially in older homes, replacing windows with a more energy-efficient product is an obvious solution, but before you go that far, upgrading to energy-efficient shades might be the best way to go. We’ll explain. Hunter Douglas introduced the first energy-efficient window treatment in 1985 in response to the global energy crisis of the 1970s. This pioneering window treatment was the first generation of Duette® Honeycomb Shades. Also known as cellular shades, these shades are uniquely designed with small air pockets in a honeycomb pattern to trap air and insulate the interior of homes. This revolutionary design changed the way the world thought of window treatments. Today, after undergoing several redesigns over the years, Duette® remains the gold standard when it comes to energy-efficient window coverings. This latest redesign of Duette® is a fashionable energy management solution that combines style with the latest innovations in energy-efficiency. Available in a wide spectrum of fabric, color and opacity options combined with the latest convenient operating systems like Vertiglide™ and Top Down/Bottom Up, and of course PowerView® Motorization, it’s easy to find the perfect Duette® Shade for your home. A contemporary combination of traditional roman shades and the energy-efficiency of honeycomb shades, Hunter Douglas presents Solera®. 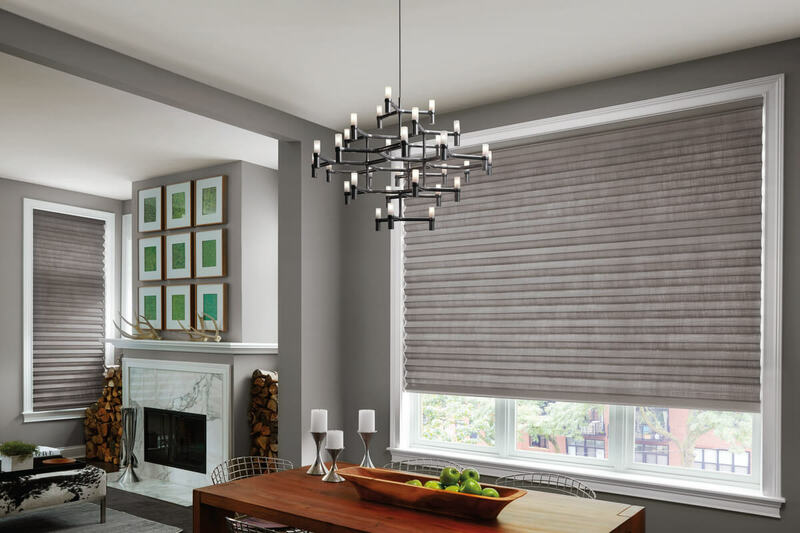 Solera® Soft Shades will give your home the insulating benefits of cellular shades with the designer look and customizable options available only with roman shades. With a wide array of fabric, color and opacity options, Solera® is an excellent choice for any room in your home. Also available with operating systems like Top Down/Bottom Up and PowerView® Motorization, Solera® Soft shades are convenient and easy to operate. One of the newest offerings from Hunter Douglas is the Sonnette™ Cellular Roller Shade. This latest innovation combines the simplicity of a roller shade with the energy-saving qualities of a honeycomb shade. This beautiful window shade gives your windows a simple and sophisticated look while insulating your windows and helping to reduce home energy costs. Sonnette™ is 100% cordless making it the perfect solution for homes with small children and pets by eliminating the safety concerns associated with dangling cords. Sonnette™ is available in 48 color choices and in both light filtering and room darkening fabrics. Hunter Douglas offers energy-efficient window covering solutions for any situation. Whether you’re looking for formal window fashions, chic and contemporary, or somewhere in between, there is an energy-efficient shade to meet your needs. Call A Shade Above today! With more than 20+ years of experience, our friendly and knowledgeable team can answer all of your questions and help guide you to the perfect window covering for your home. Whether you’re looking for energy-efficient shades, blinds, shutters, shades or the latest motorized window treatment operating systems, we can help! We proudly serve the greater Charlotte area and beyond, and we offer four conveniently located showrooms in Charlotte, NC, and Cornelius, NC as well as North Myrtle Beach, SC. Call us today to make your next home improvement project a reality!